The Cost: $29.95 for a single-child monthly subscription and $38.95 for a multiple-children monthly subscription. Price breaks for 3, 6, and 12-month subscriptions. LIMITED TIME DEAL: Now through 12/15, use code HOLIDAY25 to save 25% off your first box! Use code SUBADDICT20 to save 20% off your first crate! The Products: Each box contains a 20-page Girls Can! Activity book, 2-3 activities, creative play props, a focus character trait to practice, a character trading card for kids to think about how they can exhibit each month’s character trait, all the materials needed to complete the activities, and 2-3 practical tips for parents to help foster the chosen trait in their child. Check out all of our Girls Can! 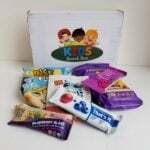 Crate reviews and the Kids Subscription Box Directory! This month’s Girls Can! Crate celebrates Ella Fitzgerald, the “the determined musician.” I’m a huge fan of Ella’s music! This card shows what is included in the box and gives ideas to parents for continuing the learning with their child(ren) after the box activities are completed. The “Take it further” section for parents is one of my favorite aspect of this subscription. I love the reframing suggestions this month! October marks the one year anniversary of this great subscription! In celebration, Girls Can! Crate sent a necklace inscribed with the word “fearless” with the October box. Girls Can! Crate stickers were included too. The 20-page activity book included in each box is amazing! Girls Can! Crate contains three great activities plus this book which is full of tons of other things to do with your child. Girls Can! Crate is one of the best subscription values I’ve seen for kid’s activities! The first activity was to make a sound wave dancer. My daughter colored Ella and her microphone, cut them out of the paper, and taped them to the Girls Can! Crate box. Then she took the paper roll, taped a round disc to one side and attached a plastic square to the other with a rubber band. Cira learned the movement of the air (when she blows in the paper roll), which causes a vibration and makes Ella dance. This is a great experiment (and future science project!). The second activity involved making a whole slew of instruments! First, we made the guitar by attaching a stick to an open box, wrapping rubber bands around the closed box and tying on a ribbon to for the strap. Cira had a great time decorating the instruments! Next, we made a harmonica by putting two flat sticks together with double sided foam square between and wrapping rubber bands around the ends. Who knew it was that easy? It really does work! To make this drum, we used a cut balloon as the taut top on a cardboard circle (drum box). Seeing how easy it was to make all these instruments/toys inspired a conversation with my daughter about what other things we could use to make toys. Last of all, we made a tambourine by using the ribbon to tie bells on the tambourine box. Now we can form our own band! Verdict: Girls Can! Crate does such a fabulous job focusing on important traits for girls to emulate in famous women. Determination was a key factor in Ella Fitzgerald’s life and it is important to success in any work. I’m always impressed by how much there is to do and learn from this box! The box contents are well thought out and planned to the monthly them. Plus, Girls Can! Crate has a worthwhile mission along with incredible execution, value, and design. This box has a bit of everything I look for when spending money on activities for my child – fun, education, empowerment, interest, longevity, and quality. Plus, they donate 10% of the proceeds from each crate to organizations such as Girls Education and Mentoring Services (GEMS), Days for Girls, and SheHeroes. This subscription is a winner! What do you think about Girls Can! Crate? How do subscribers rate Girls Can! Crate? Do you subscribe to Girls Can! Crate? Add your rating now!